Mining has played an important if sporadic role in the economic, social, and cultural history of Newfoundland and Labrador. While Joseph Jukes noted many of the island's mineralogical and geological features in reports of his explorations during the 1830's and 1840's, the first systematic attempt to map out the island's mineral possibilities was Alexander Murray's Geological Survey. (The Geography and Resources of Newfoundland was published in 1877.) Both Canada and the United States were conducting similar surveys at the time, as part of a worldwide trend. The huge iron ore deposits of Labrador and neighboring areas of Québec were discovered by the Canadian survey in 1892. Internationally, of course, mineral products were one of the keys to industrialization. Murray's survey and similar initiatives were also part of a general thrust in Newfoundland itself: the effort to open up the resources of the interior, to provide employment for the island's growing permanent population, and to emulate the continental model of resource development. The increased attention to mineral resources was therefore part of the same general trend which spurred construction of the railway and similar land-based developments. Many of the key political figures of the period were involved in both the mining and railway enterprises. Perhaps the most notable of these was Charles Fox Bennett, who led the anti-confederate forces in the Newfoundland election of 1869, and was for decades a key player in the island's exploration and mining industries. 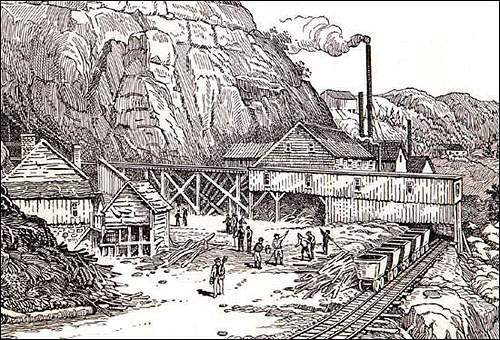 Small-scale mining efforts were undertaken as early as the 1770s, but the first major mining development in Newfoundland was begun in Tilt Cove, on the northeast coast, in 1864. 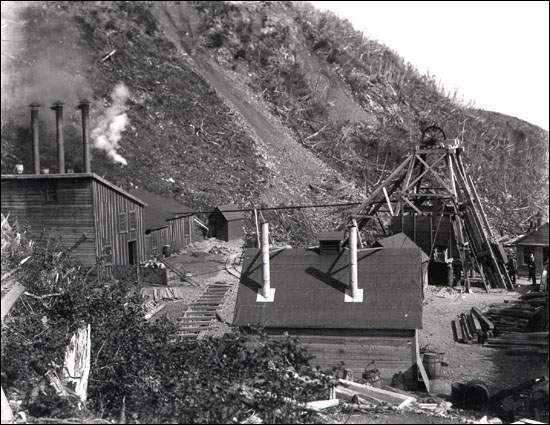 Large copper deposits and fairly high traces of gold had been discovered there in 1857, and from 1864 to 1917, Tilt Cove was at times one of the world's largest producers of copper. In 1917, international market and military conditions, as well as problems of ore grade and accessibility, forced a shutdown of the mines. Operations were re-started there in 1957, after the Maritime Mining Company discovered further deposits, and continued until 1967. View of a mine, probably Tilt Cove, n.d. Tilt Cove was at times one of the world's largest producers of copper. Courtesy of Archives and Special Collections (Coll - 137, 13.06.002), Memorial University of Newfoundland, St. John's, NL. The Tilt Cove discovery signalled the beginning of an intense period of mining activity on the northeast coast. In Terra Nova, thousands of tons of copper ore were mined and shipped out during three separate periods (1860-64, 1902-06, and 1910-15). At Bett's Cove, just southwest of Tilt Cove, large quantities of copper and pyrite were extracted until the mine roof collapsed (miraculously without loss of life) in 1873, while in Little Bay tens of thousands of tons of copper ore and nearly 200,000 grams of gold were mined and shipped, again in three distinct periods (1878-94, 1898-1901, and 1961-68). At Pilley's Island a sizeable copper and pyrite mine operated from 1887-89, from 1892-99, and again from 1902-08. Copper Mine at Bett's Cove, n.d.
At Bett's Cove large quantities of copper and pyrite were extracted until the mine roof collapsed in 1873. Artist unknown. From J.A. Cochrane, The Story of Newfoundland (Montreal: Ginn and Company, 1938) 213. The other major group of mines in the area was the Consolidated Rambler Group, which included Rambler, Ming, East, and Big Rambler Pond mines. Most of these ore bodies were discovered shortly after the turn of the century, but the mines were opened much later, in the 1960's and 70's, and were short-lived operations. Other northeast area mines included: Whalesback (discovered in the nineteenth century but first run by Brinex from 1965 to 1972); Gullbridge (discovered 1905 and run from 1966-71); York Harbour (discovered 1893 and run from 1902-05 and 1909-13); and Little Deer Pond (discovered in the 1960's, and opened and closed in the same year, 1974). While these northeast coast copper, gold and pyrite mines were productive when in operation, most of them, with the exception of Tilt Cove, were relatively small enterprises. The iron ore mines of Bell Island were a different matter. Opened by the Nova Scotia Steel and Coal Company (Scotia) in 1895, by 1900 the Bell Island mines had become one of the leading sources of iron ore in the world, and Scotia had been joined in 1899 by the Dominion Steel Corporation. 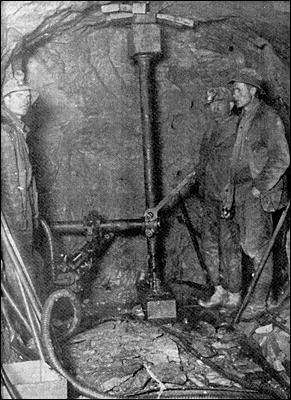 By 1910, hundreds of miners were working tunnels stretching for miles out under the sea floor, extracting the iron ore that fed the huge steel mills of Sydney, Nova Scotiaas well as other, more distant plants. By 1901, the population of Bell Island was 1,320, compared to just 701 only ten years earlier. Over the decades until shutdown in 1966, the Bell Island mines were plagued by a number of problems, such as legal and financial wrangling among distant owners, international wars, fluctuating ore prices, and competition from other producers. Ownership of the mines changed hands many times. Cutbacks and curtailments were a constant feature of life, and over the years the workers fought numerous battles for improved wages and working conditions. When the last shaft closed in 1966, however, Bell Island was the longest continually operating mine in Canada. Though large quantities of ore are reported to still to exist there, the Bell Island mines have not re-opened. In 1905, another major island mineral discovery was confirmed when the Anglo-Newfoundland Development (AND) Company tested ore samples from around the Buchans River area and found they contained commercial quantities of zinc, lead, copper, gold, and silver. Not until 1925, however, was a process established to separate the minerals, after the AND joined forces with the American Smelting and Refining Company (ASARCO). The AND, which also controlled most of the vast timber resources in the area along with the major transportation routes, began in 1927 to construct a genuine company town in the Newfoundland wilderness. Though the company kept the workforce under a constant threat of shutdown, the Buchans mines operated for nearly half a century. Buchans was also the site of some major labour and civil unrest, in 1941 and again in the early 1970's, when the Buchans miners staged what was to that time the longest strike in the history of Newfoundland. The Buchans mines operated for nearly half a century. 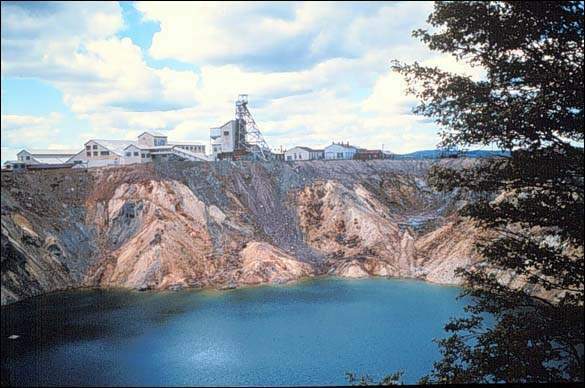 The other two major twentieth century mines on the island of Newfoundland were the St. Lawrence fluorspar mines and the Baie Verte asbestos mines. In St. Lawrence, on the Burin Peninsula, the American-based St. Lawrence Corporation of Newfoundland began in 1933 to extract and export the area's vast bodies of fluorspar for use in the United States chemical, manufacturing and military industries. The Corporation was joined in 1939 by the Newfoundland Fluorspar Company, a subsidiary of the Aluminum Company of Canada (ALCAN). By 1961, ALCAN had bought out the Corporation's holdings to become the sole operator. The St. Lawrence mines shut down in 1978, with the company citing labour unrest and the ready availability of cheaper fluorspar in Central and South America as the primary reasons. In 2016, there was talk of re-opening the mines. Though the St. Lawrence mines provided steady wage-work to a great number of people for a number of years in an area that was characteristically economically depressed, they also brought a great deal of suffering and hardship. Over the years, many who worked the mines died (and continue to die) from silicosis caused by dust exposure, or from lung cancer caused by the radon gas which is released during the mining process. In Baie Verte, Advocate Mines, a division of the giant Johns-Manville company, began production of an open-pit mine in 1963, to mine the area's asbestos deposits. By the 1970's, it had become apparent to many people that asbestos was creating health problems among the workforce. An expert report published in 1977 confirmed the link between asbestos mining/milling and the high rates of cancer and respiratory diseases in the area. The report came at a time when other contract matters were being negotiated, and triggered a long and bitter period of labour and civil unrest over issues of occupational health and safety, and the health of the local population in general. The Advocate operation shut down in 1981, but the asbestos mines were re-opened in 1982 by Transpacific Asbestos Limited, this time under the name Baie Verte Mines Limited, which ran the mines until market and accessibility problems, along with health and legal difficulties, forced them to shut down in 1990. In Labrador, though substantial iron ore deposits were discovered in 1892, isolation and other factors prohibited mining until the 1940s, when electrical and railway facilities open the area to industrialization. The Iron Ore Company of Canada (IOC), a conglomerate of eight companies began mining iron ore at Knob Lake, near Schefferville on the Québec side of Labrador/Quebec border in 1954. In 1962, IOC moved into the Carol Lake area of Labrador City and opened the Smallwood iron ore mine. In 1965, Wabush Mines Limited opened the Scully mine at Wabush. By the mid-1960's, Labrador was established as one of the world's largest and most important iron ore producing regions, and continues to export large amounts of iron ore.
Other substantial mining operations have, of course, operated in Newfoundland and Labrador. At Daniel's Harbour on the Great Northern Peninsula, large quantities of zinc-rich sphalerite ore were mined from 1975 to 1989. There were also at various times small gold mines in places such as Moreton's Harbour, Sop's Arm, and Ming's Bight, precursors to the more recent gold-mining operations in such places as Hope Brook. In addition, many quarry-type mines have operated in Newfoundland over the years, such as the Dunville silica quarry, the Random Island shale quarry, and the Flat Bay gypsum quarry. There have also been many attempts to establish mining operations of one kind or another which, because they met with failure or limited success, tend not to be mentioned in most historical accounts. A good example of this is the early twentieth-century attempt to establish a coal-mining industry in places such as St. George's. Even a cursory account such as this, however, gives us some indication of the important and varied role mining has played in the history of Newfoundland and Labrador. It also allows us to draw a few general conclusions. In the vast majority of cases, mining enterprises are owned and controlled by distant, usually anonymous powers. In a certain sense this is inevitable. Mining is a highly speculative enterprise, requiring large outlays of capital. Generally, only major international firms are able and willing to undertake such enterprises. Unfortunately, the companies often have little interest in long-term, sustainable development of the areas in which they operate. This is especially true of the mining industry in a place like Newfoundland and Labrador. Without a strong manufacturing or industrial sector, this area has been viewed and utilized (as are other peripheral places such as the Canadian North) primarily as a source of raw materials, which are extracted and exported for use by industries elsewhere. A mine is, of course, by its very nature a temporary enterprise. Every day a mine is worked, it is a day closer to shutdown. Add to this the fact that prices and markets are often shaped by forces beyond the control or even the knowledge of the local population, and what emerges is a picture of a local industrial operation which is highly unreliable, much given to a boom-and-bust cycle, and doomed to termination when the resource is exhausted. That is one of the lessons which we can take from the history of Bell Island, Buchans, St. Lawrence, Baie Verte, and the various other places where this process has taken place. Places scarred by industrial disease, such as St. Lawrence and Baie Verte, offer still harder lessons in the possible consequences of this brand of resource development. Reproduced by permission of David Liverman, Government of Newfoundland and Labrador. From Geological Survey of Newfoundland and Labrador - "Aspects of Mining in Newfoundland and Labrador: Production." http://www.gov.nl.ca/mines&en/geosurvey/. On the more positive side, mining has in some cases provided many people with relatively stable, paid employment, and in many instances helped free them from dependence on an unpredictable fishery and on the local merchant. In cases where a strong union movement emerged, the mining industry has provided people with the experience and the sense of solidarity required to assert their rights in a potentially exploitative situation. This is especially true in instances where local unions joined forces with larger international organizations, helping them to overcome the sense of isolation and dependence that is often characteristic of company towns remote from other industrial operations. Because mining often involves a great deal of migration, as workers move from one job site to another to seek better wages and conditions or when a mine shuts down, the mining industry also helps establish connections and cohesion between people who might otherwise remain isolated from one another, and again this can be especially helpful in the struggle for workers' and citizens' rights. In places where a major mining industry was established and grew, many traditional practices and values were altered or eradicated: how people lived and worked on the land or the sea; how they organized their time throughout the day or across the seasons; how families related and operated in the context of home and work. All these things and many others were deeply and permanently affected by the incursion of these new industries. The overall consequences were mixed; prosperity and rapid growth often had dark side as well. New prospects for landward development now loom on the horizon in Newfoundland and Labrador. The Voisey's Bay nickel project, for example, promises to be a major mining and export operation. Many of the same factors which influenced decision-making in the past, such as high unemployment and hard economic times, have once again come into play. This is especially true in the context of the collapse of the cod fishery. The history of mining in Newfoundland and Labrador teaches us that giant industrial developments such as that set to take place in the Voisey's Bay area, while they bring many benefits, also bring with them certain costs. Those costs might, in the Voisey's Bay case, be borne primarily by native peoples in the area. In the broader historical picture, many of the issues facing them, such as the question of how the introduction of a major mining operation will change their traditional way of life, are the same issues which have confronted many rural Newfoundlanders over the last century or so. While current reports on the size and value of the Voisey's Bay deposits encourage optimism, history urges caution. For other related articles view the Mining section of the Economy Table of Contents.